Indonesian youth are undeniably starting to take the lead in many modern movements throughout the country — and creative media is no exception. Resurrecting the almost-lost Indonesian cultural value of gotong royong (working together for the common goal), a group of local creatives are joining forces to produce another hit indie flick made possible through crowd-funding. The film, “40 Days in Europe,” will present the beauty of the angklung, a traditional musical instrument indigenous to Indonesia. The film will be set both in Bandung, West Java, and several locations in Europe. Adapted from the memoir of the same title, “40 Days in Europe” revolves around the dilemma of its protagonist, Ligar, in choosing the conductor for an Angklung orchestra sent abroad for a cultural exchange program in Europe. The story evolves into a tale of determination, struggle and leadership as Ligar and the orchestra’s members, faced impossible challenges in keeping their project on track in an unfamiliar land. Ligar’s experience is based on the real life story of the book’s author, Maulana M. Syuhada, who served as the latest film’s scriptwriter and producer. An engineer by training, Syuhada holds a Ph.D. in management science from the UK’s Lancaster University. His passion in arts, music, and culture has led him to engage in many activities that promote Indonesian arts and culture. He co-founded several traditional music groups, such as the Angklung Hamburg Orchestra (2002), Sabilulungan (2003), Lancaster Angklung Orchestra (2009) and Angklung Manchester (2012). “40 Days in Europe” is a memoir about his experience leading an angklung group (KPA 3) in a seemingly “impossible journey” across Europe. There, they won first place in the musical group category at the 2004 Highland Folklore Festival in Zakopane, Poland, as well as its audience award. They also won the Best Group Award and the audience choice award at the 50th International Folklore Festival in Cerveny Kostelec, Czech Republic. 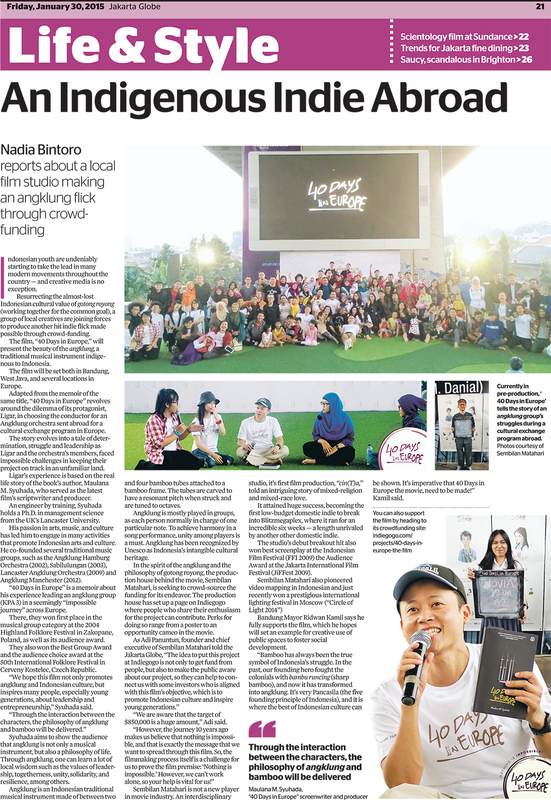 “We hope this film not only promotes angklung and Indonesian culture, but inspires many people, especially young generations, about leadership and entrepreneurship,” Syuhada said. Syuhada aims to show the audience that angklung is not only a musical instrument, but also a philosophy of life. Through angklung, one can learn a lot of local wisdom such as the values of leadership, togetherness, unity, solidarity, and resilience, among others. Angklung is an Indonesian traditional musical instrument made of between two and four bamboo tubes attached to a bamboo frame. The tubes are carved to have a resonant pitch when struck and are tuned to octaves. Angklung is mostly played in groups, as each person normally in charge of one particular note. To achieve harmony in a song performance, unity among players is a must. Angklung has been recognized by Unesco as Indonesia’s intangible cultural heritage. In the spirit of the angklung and the philosophy of gotong royong, the production house behind the movie, Sembilan Matahari, is seeking to crowd-source the funding for its endeavor. The production house has set up a page on Indiegogo where people who share their enthusiasm for the project can contribute. Perks for doing so range from a poster to an opportunity cameo in the movie. “We are aware that the target of $850,000 is a huge amount,” Adi said. Sembilan Matahari is not a new player in movie industry. An interdisciplinary studio, it’s first film produ ction, “cin(T)a, ” told an intriguing story of mixed-religion and mixed-race love. It attained huge success, becoming the first low-budget domestic indie to break into Blitzmegaplex, where it ran for an incredible six weeks — a length unrivaled by another other domestic indie. The studio’s debut breakout hit also won best screenplay at the Indonesian Film Festival (FFI 2009) the Audience Award at the Jakarta International Film Festival (JiFFest 2009). Bandung Mayor Ridwan Kamil says he fully supports the film, which he hopes will set an example for creative use of public spaces to foster social development. “Bamboo has always been the true symbol of Indonesia’s struggle. In the past, our founding hero fought the colonials with bambu runcing (sharp bamboo), and now it has transformed into angklung. It’s very Pancasila (the five founding principle of Indonesia), and it is where the best of Indonesian culture can be shown. It’s imperative that 40 Days in Europe the movie, need to be made!” Kamil said.